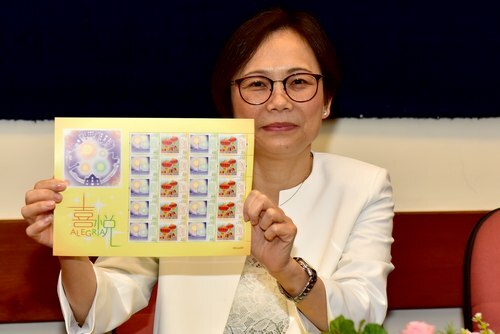 Macao Post and Telecommunications Bureau will issue the stamp theme “Joy” on 26th June, 2018. 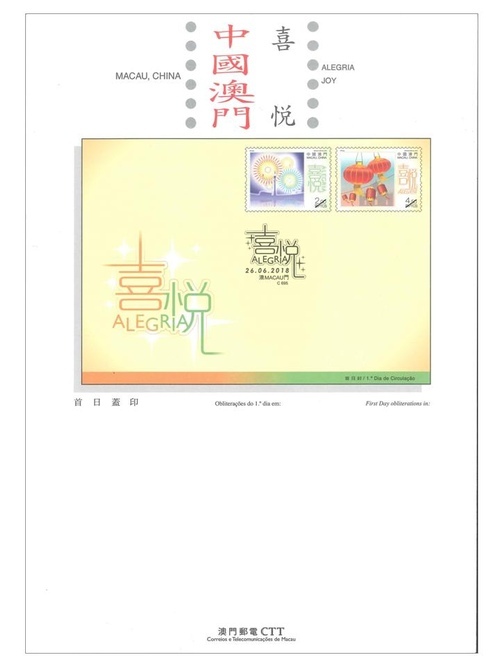 This is the fourth issue of similarly-themed commemorative stamp and also incorporate the issue of personalized stamp with the same theme, the first three issues are “Love and Blessings” in 2005, “Celebration” in 2008 and “Festivity” in 2015. This commemorative stamp consists of a set of two stamps. 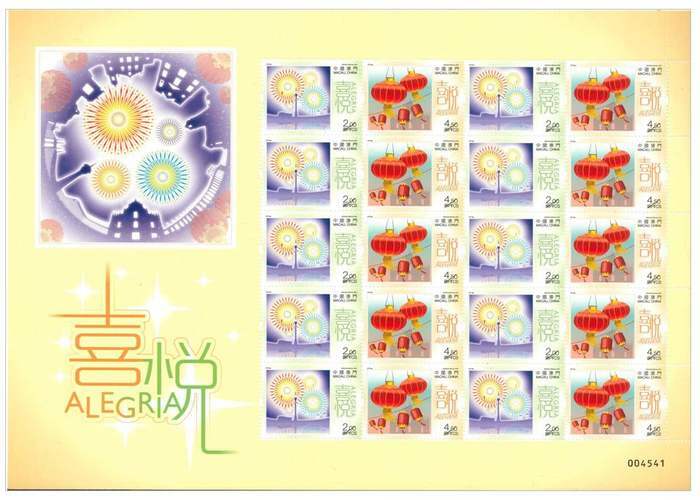 The first one is pastel green in colour, with gorgeous fireworks let off in dark night; the second one is pale yellow in colour, with a festive Chinese red lantern to demonstrate the joy of Chinese celebration. The brightly-lit lanterns, coupled with the gorgeous fireworks, brims with bliss and joy. Personalised stamps are customised mementos for individuals to commemorate the birthdays, graduations, wedding anniversaries, festivals and family portraits of themselves and their beloved ones, thereby preserving the many previous moments of their lives. Companies, organisations and associations can include their company names as well as concrete images and symbols on the personalised stamps to make them exclusive business gifts. 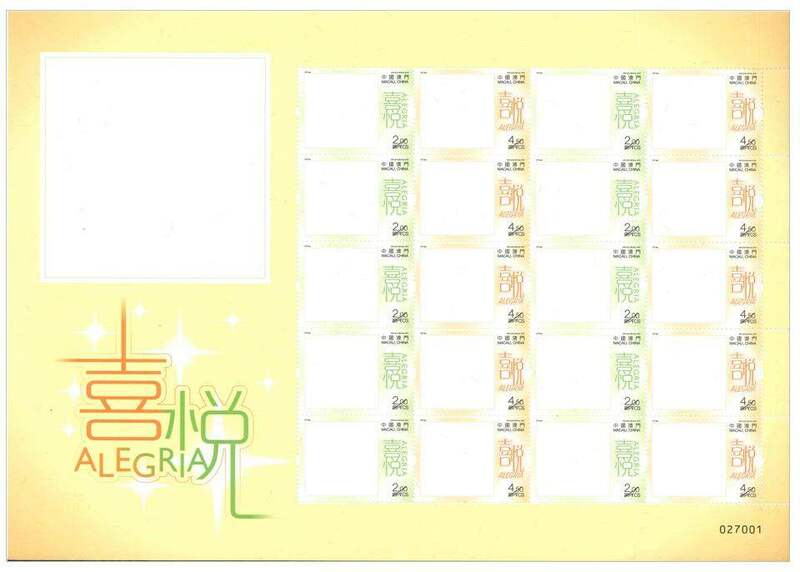 Customers who wish to order the personalized stamps can obtain the application form at the General Post Office or any post offices; it can also be downloaded at CTT Macao website: www.ctt.gov.mo. For the customers who have successfully subscribed the personalized stamps before 31/05/2018, customers can bring along the subscription receipt and I.D. Card to the General Post Office at the above working hour for collection on the issue day. The limited quantity of First Day Cover (without stamps) will be available for sale at the Philatelic Shop of General Post Office on the issue date, customers can produce their own First Day Cover by affixing the personalized stamps with the issue postmark for your collection or mail to your beloved friends and relatives in sharing your joyfulness. 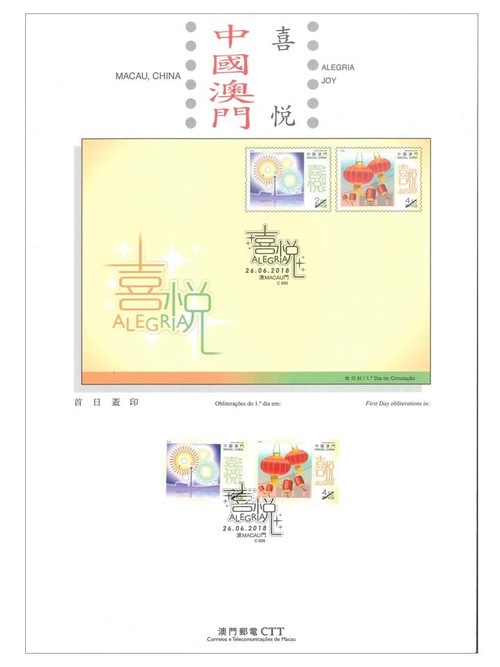 The design of this stamp issue and the text of the information brochure are responsible by Macao Post and Telecommunications Bureau. This is the fifth theme in 2018. 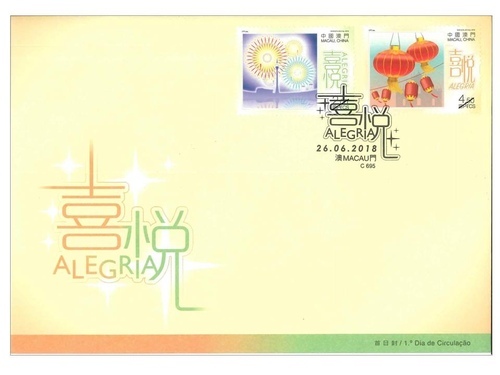 The previous issued stamps are “Lunar Year of the Dog” on 05/01/2018, the label stamp “Lunar Year of the Dog” on 31/01/2018, “Macao 2018 – 35th Asian International Stamp Exhibition (I)” on 01/03/2018, “Mainland Scenery VII” on 12/04/2018, and “Classic Fables and Tales” on 30/05/2018. 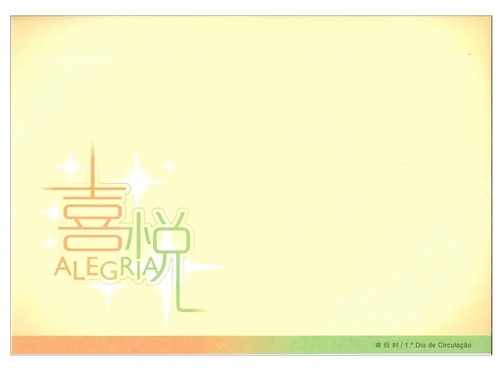 Technical Data of Stamp "Joy"